Could it be possible for a region to experience a change of it’s biome? If you think that this is absolutely ridiculous, I hate to break it to you, but you are wrong. It is completely possible for a region to have a change in it’s biomes overtime. But first, you may be wondering what a biome is, so here is a little refresher. A biome is a large area on the earth’s surface, which is defined by it’s abiotic factors such as climate, precipitation, geology, soil, and vegetation. In each of the biomes, the animals and plants have to learn to adapt to the environment. A common misconception is that a biome is an ecosystem, but that is actually not true. Although it may seem that a biome is a large ecosystem, in a biome the plants and animals have adaptive qualities and because of this you will also find multiple ecosystems in a biome. More specifically, the grassland biome is predominant with different species of grass, with a few trees and bushes scattered across. There are two types of grasslands, the Savanna Grassland and the the Temperate Grassland. The grassland biome can be considered the medium or the in-between of a desert biome and rainforest biome. Because of it’s temperatures, it can be considered to be either, and because of it’s lond dry season, it can be classified as a desert. 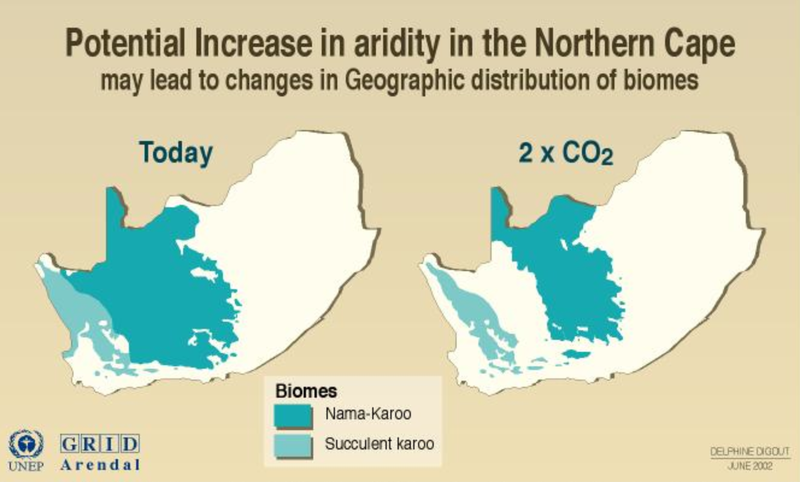 Now back to what I was saying, an example of changing biomes is currently happening in South Africa. Because of the increasing temperature, which has to do with climate change, and the change in precipitation, South Africa is facing the challenge of trying to preserve the grassland biome. The grassland biome is getting reduced in size, which is leading to an increase in the desert biome. 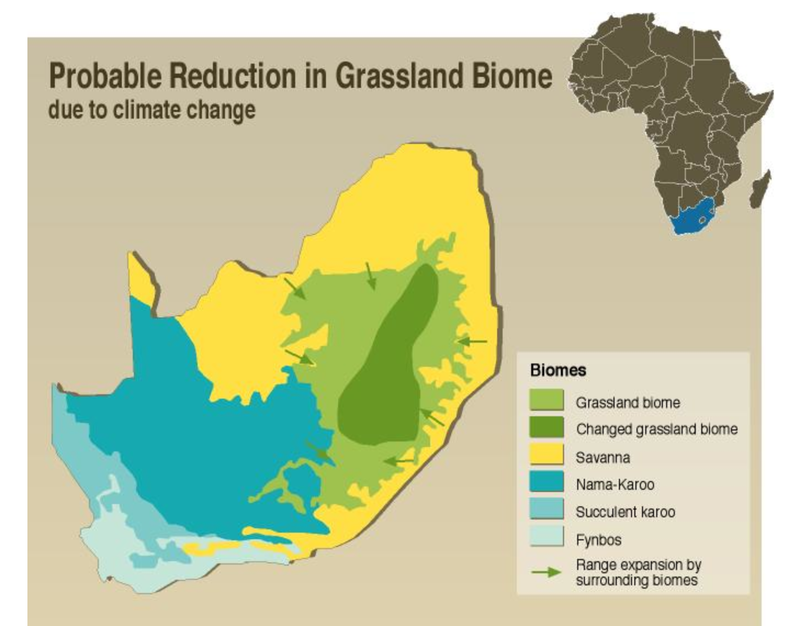 You can see in figure one, that even though there are several different types of biomes in South Africa, there is a large difference in the size of the grassland biome from several years ago to now. The reason that this is such a big deal is because if the grassland biome begins to decrease, it will affect all of the animals and plants that have adapted to the certain biome. Some of these animals may not be abel to make the transition, which will cause them to die. 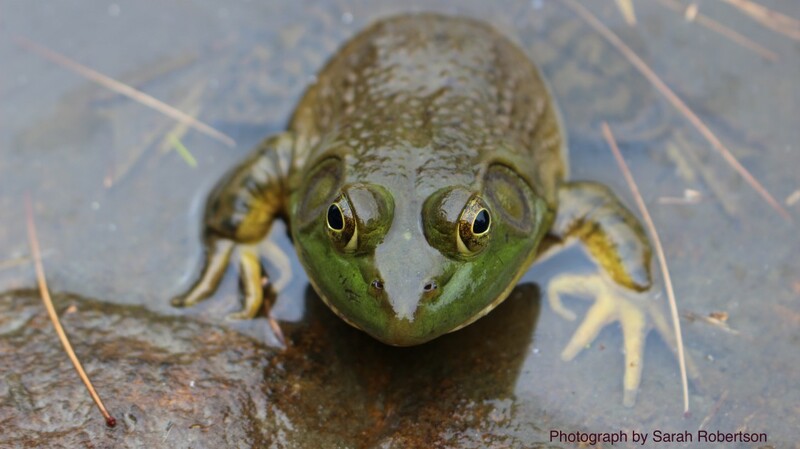 This in turn can have a drastic impact on the ecosystems in the biome and the food web. For instance, if a zebra is unable to find grass, which it’s main source of food, then the number of zebra’s will decrease. This will then effect the cheetahs, which feed on the zebras. Another reason that this is harmful is because of the increase in aridity, which refers to the dryness of the atmosphere. Because of the aridity, the area of the atmosphere can shrink. If you look at figure 2, as of 2002, the area highlighted in blue was rather large, but as the years progress, the area has shrunk because there is double the amount of CO2 emissions. All in all, the changing of biomes is extremely hazardous to the environment and the ecosystems in these environments. The excess levels of CO2 in the atmosphere area result of humans; therefore, with less CO2 emissions, the changing of biomes can hopefully come to an end. I think you did a nice job explaining how changing biomes can be hazardous. I found your post very interesting. In your post you state that CO2 emissions was a main cause of the change in biomes. I was wondering if their were other contributing factors such as an increase in green house gases. You also state that animals will die out if they are unable to make the transition. Is this because the change is happening to quickly? I personally did not realize the effect a change in a biome would affect other biomes. I find it interesting that the biomes differ so much yet they are all connected in more than one way. Overall great job! Pooja, your post explains how the change in biomes is actually quite plausible. You remind us that the abiotic factors are such a crucial part of identifying biomes. However, the changing biomes you mentioned seem to be more so shrinking than changing. If this is the case, wouldn’t mobile organisms be able to move to those shrinking areas. (Not that it isn’t a bad thing.) If they can’t adapt, wouldn’t they move, like how fish move to their preferred temperature? You are right, the biomes are shrinking in this case; however, I see this as a very negative thing. The reason that this idea can be so dangerous is because if animals decide to move to their correct biome, then they would disturb the natural ecosystem as well as the food chain. Furthermore, several of these animals won’t be able to move in time because they will die before they realize that they have to move. Thank you for making me think more and outside of the box!